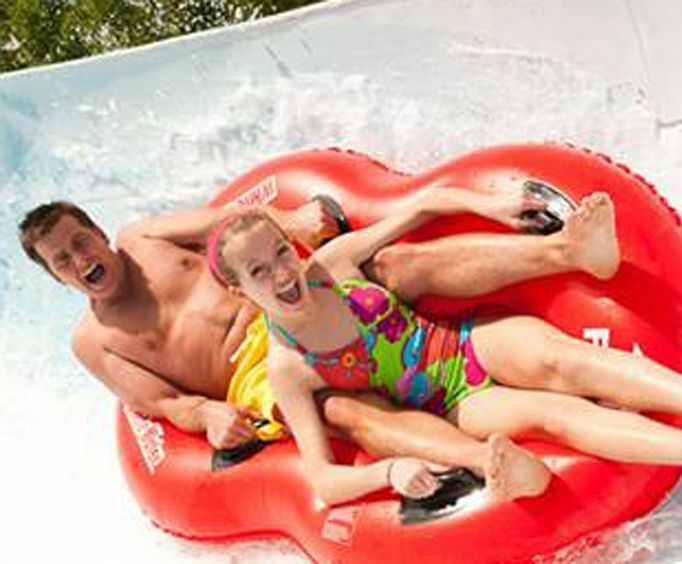 Beat the heat at White Water Branson with 2 million gallons of refreshing, water park fun for the whole family. White Water Branson, Mo. opened in 1980 and was advertised as a 'beach within reach.' Over time, it has expanded that reach and grabbed the attention of families all over the country. The tropical paradise of White Water Branson features an exciting variety of thrilling rides, themed attractions, relaxing poolside hangouts and delicious summer snacks and is conveniently located in the midst of several other Branson theaters and attractions. A popular and reoccurring Night Water event even allows visitors to come early and stay late with extended park hours, dive-in movies, fireworks and more. One of the world's largest travel guide publishers, Fodor's Travel, listed White Water Branson as one of the top 10 Best Water Parks in the USA citing it as a 'well organized, family centered park' with attractions for all ages. This incredible water park was created with the family dynamic in mind and features something fun for everyone. Rides, relaxation, shopping and dining make for an all-encompassing water park experience that can be found at none other than White Water Branson. KaPau Plummet: The newest addition to White Water Branson, these dueling 245 foot slides will get your heart racing with a free fall at 26 feet per second. You'll make one heck of a splash after your 70 degree plunge down through the encapsulated slide. Aloha River at Hula Hula Bay: Let the calm waters of the Polynesian jungle take you on a relaxing ride through cooling misters, bubblers, geysers, a 30 foot tiki tower and more. Coconut Cove: This cove is perfect for kiddos who love to splash. Multi-lane slides and spraying and shooting nozzles in a shallow pool provides the little ones with a special place to play while parents watch over. Kalani Towers: Body surf at 40 miles per hour down these 300 foot drop slides and race all the way down to the big splash. Ohana Falls: Cool off with this raft ride for all ages as you face unexpected twists and turns, drops and dips. Pipeline Plunge: You'll love this fast and furious race as you careen around corners and plunge to the pool at the bottom. 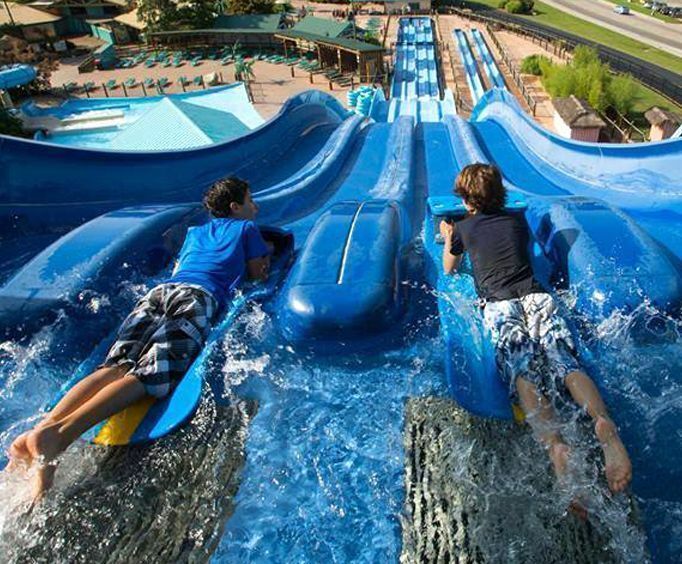 Raging River Rapids: Take a fast and furious trip to the pool below as these two 200 foot, interactive double-speed slides send you racing to the finish line. 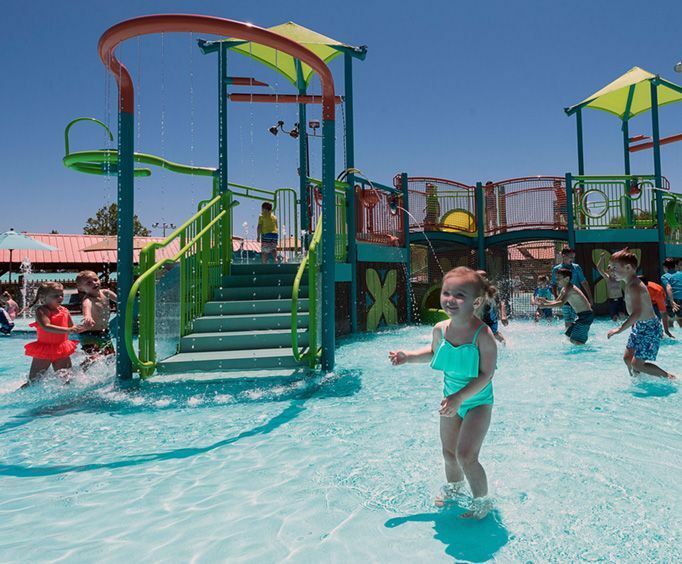 Splashaway Cay: With 20,000 square feet of island adventure, kids of all ages will have fun splashing and playing in the spraying geysers, elevated walkways, aqua shooters and 150 foot long escape slide. Surf's Up Wave Pool: This pool holds 500,000 gallons of calm water to swim and float in. Listen for the bell that signals the eruption of 4 foot waves that will have you clambering for your inner tube. Surfside Trading Company: Pick up all kinds of beach wear and souvenirs like sunglasses, White Water t-shirts, beach towels, swimsuits, jewelry, hats and more. Includes all rides and attractions. There are shops, restaurants, ATMs, etc. What style of dress is recommended? Is parking available on-site? If so, is there a fee? Yes. Parking is free with paid options. Are lockers available at White Water Branson MO? If so, is there a fee? Yes. There is a rental fee. Are tubes available at White Water Branson MO? If so, is there a fee? Tubes are free on tube rides. I loved the fact that my 2 year old son was able to ride the water slides. My older children were able to go to all the rides and it wasn't too crowded so they could go through the lines quickly. We can't wait to go again. I remember the first time i went to white water, i was too short to ride the big slides but i really enjoyed the wave pool and still enjoy it to this day. If you go, the wave pool should be the first place you go! Had lots of fun here! The big blue slides were amazing!